Did you know that two-thirds of Americans have had a particularly upsetting or disappointing experience in a public restroom? This number might as well translate to two-thirds of all your business’ customers if you are not careful or thorough! The same survey reveals poor plumbing, unpleasant odor, and poorly-equipped and empty dispensers as among the chief complaints of customers against business restrooms. Customers who are particularly unhappy with the condition of the restrooms are more likely to have a negative image of the business, and worse, are less likely to return. Would you really want to lose customers over poorly-maintained restrooms and improperly stocked restaurant restroom supplies ? You can do better than that! We’ve got tips on how to create restrooms that your customers will truly appreciate! With the exception perhaps of people with masochistic tendencies, nobody likes being in a foul-smelling room. It comes as no surprise, then, that foul odors in the restroom rank among the top complaints in public restrooms. Invest in a good, clean-smelling bathroom deodorizer or diffuser to maintain a pleasant aroma wafting throughout the restroom all day. Pick a scent that is strong enough to mask the unpleasant smells that naturally can develop in public restrooms, but nice and relaxing enough to make the visit a comfortable one. 2. Keep everything clean and dry. Nobody likes a wet restroom. And there’s a good reason for that. Wet floors and counters, and worse – wet door handles and toilet seats – are a sign of neglect and a constant and rather unpleasant reminder that other people are using the rooms for their ‘dirty deeds’. Wet spots are also a favorite hub for bacteria and microbes to multiply. When people see wet floors and sinks, they understandably and instantly associate them with nasty things. Stock up on dry mops, floor mats, and a whole stockroom full of microfiber towels to keep your restroom surfaces completely dry. 3. 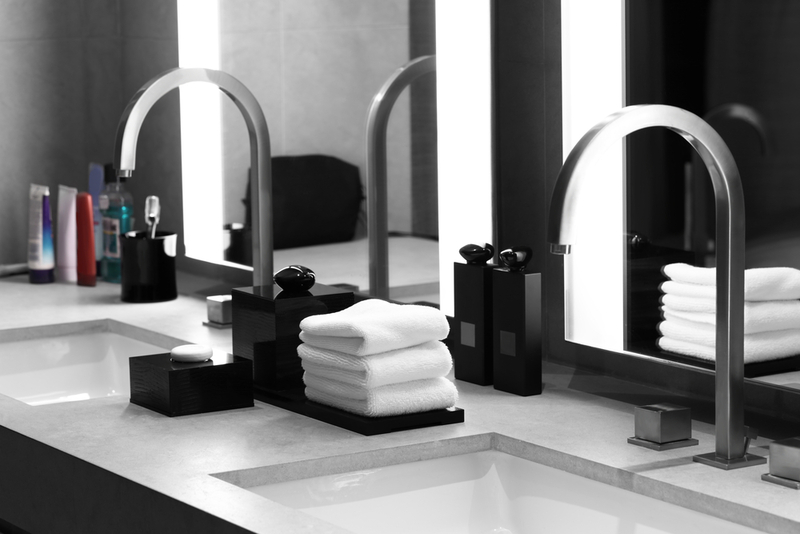 Reserve the mood lighting for your home bathroom. Dimly-lit public restrooms are a huge mistake. They may seem romantic but nobody really wants to second-guess whether the dark spot on the floor is a shadow or something more sinister. Invest in good lighting, your customers will appreciate it. 4. Never be caught dead with an empty toilet paper roll. Getting trapped in a restroom with an empty toilet paper roll is not only the stuff of internet jokes, but of real, actual nightmares. Spare your customers this fearsome and absolutely loathsome predicament by making sure your stalls and restrooms are always well-stocked with toilet paper and paper towels. 5. Don’t forget to decorate. While some businesses totally go overboard with restroom decor, a touch of color on one wall, a fresh vase of flowers, or some nice tile mosaic should give some character to the public restroom. It’s well worth giving public restrooms a nice break from all the bad rap. Public restrooms are a paradox. We know that a gazillion other people have done their dirty deeds in them but we absolutely do not want to be reminded of it – even when the next person in line is literally standing right outside your cubicle door waiting to take their turn after you. And certainly, we don’t want to see any physical ‘remnants’ of these other people we’ve had the pleasure of sharing the restroom stalls with. Invest in a good plumbing system and make sure to keep them in regular check. Make sure the flushes and faucets are working. Check for leaks on the regular. Replace rusting or loosened fixtures. 7. Keep your dispensers full. Whether it’s the hand soap or the hand sanitizer, your customer will appreciate them. Handwashing is, after all, the best defense against diseases that are transferred by hand and your customers will appreciate knowing that you care about their welfare, even in the smallest and most basic of ways. We can help stock restroom supplies. But keeping an eye out for those dispensers and toilet paper rolls is a full-time job for which you may not exactly have the time. That is why you have to entrust these kinds of things to experts who specialize in keeping restrooms in their best shape. Contact Republic Master Chefs! Republic Master Chefs has a full line of products for your restroom maintenance – from toilet paper dispensers to hand sanitizer dispensers. We offer on-time, efficient, and hassle-free restocking, and options to help keep the costs down. Contact Republic Master Chefs today at 800-640-2433 to get started on your business’ best restroom ever!